Attorney Stuart Schrier defends landlords at the Boston Just Cause Eviction hearing. The appearance of Dorchester attorney Stuart Schrier informed the City Council of violation of federal law and caused landlords to erupt in cheers. 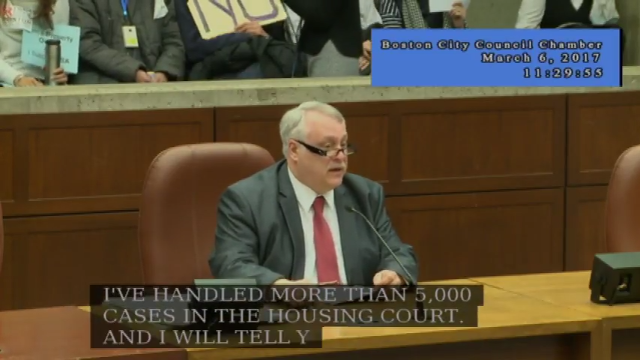 On Monday, March 6, the City of Boston heard arguments for and against the Jim Brooks Stabilization Act, commonly known as “just cause eviction.” The hearing lasted six hours and can be watched on YouTube. The city council did not vote. The most notable event at the hearing was the appearance of a Dorchester Attorney, Stuart Schrier, whose testimony pointed out a violation of the Fair Debt Collection Practices Act. Schrier has practiced law for 35 years, has had 5,000 cases in housing court, and has sent out over 5,000 notices to quit, according to his testimony. Lydia Edwards, head of the City’s Office of Housing Stability, had previously gone on record stating that the Jim Brooks Act was primarily about gathering data. Schrier pointed out that much eviction data is freely available to the City at MassCourts.org. First, he offered a comparison to the lead law notification. 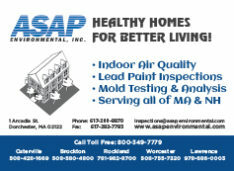 Every new tenant must be notified of their rights under the lead law. The same kind of packet could be a required addition to rental agreements in the City of Boston. This would be just as enforceable as the City’s current proposal, and would cost only the paper it was printed on. If Edwards or the City of Boston agreed to Schrier’s suggestions, it would be a welcome and entirely unexpected about-face. He described how the eviction process is full of delays designed to help the disadvantaged buy time. Paraphrasing, “I’ve never seen answers to discovery questions be used in court.” This makes the discovery process a pure delay. 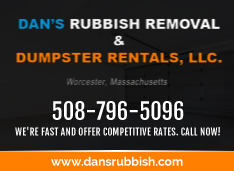 The average eviction lasts 55 days, start to finish, according to a 2015 study by MassLandlords. The longest eviction was one year, three months, two weeks, and two days. Schrier’s personal testimony gave matching timeframes. Schrier pointed out that a judge can grant a stay of execution up to six months to help a disadvantaged tenant. In the case of someone elderly or disabled, a judge can grant an additional six months for a full year’s delay, provided the tenant pays rent. Schrier didn’t complain about these delays, presenting landlords as aware of and understanding of the plight of our less fortunate residents. Schrier went on to make a point that MassLandlords had not yet heard, and perhaps neither had the City. His point neutralizes the bill. It reveals Eugene O’Flaherty, the Corporation Counsel who signed off on the Jim Brooks Act, to be in serious error about the legality of the Act. The Jim Brooks Act is a violation of both the state and federal Fair Debt Collection Practices acts. Both state that a creditor cannot divulge a private debt to a third party. The law carves out specific exceptions for court cases only. Here is how it works. 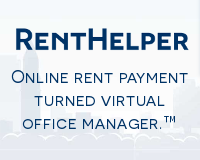 When a tenant is issued a notice-to-quit, they become a debtor to the landlord. This notice cannot be shared with anyone. Under state law, the landlord cannot even threaten to share the notice, let alone actually sharing it. Under the Jim Brooks Act, the City seeks to compel disclosure without the tenant’s express written permission. A city staff person reviewing a notice-to-quit might be the tenant’s neighbor, friend, or relative. It would be embarrassing and ostracizing. If the notice is paid or settled, it would also be irrelevant, and no one else’s business. The law prohibits such disclosures because of the negative side effects they create for the debtor. Also, in many cases, the information ends up in the hands of harassing debt collection agencies. Until it ends up in court, no one can know about your eviction. This is a fundamental civil protection. It is not known whether Mayor Walsh or city staff can continue to pursue the law as written now that federal law has been brought into play. 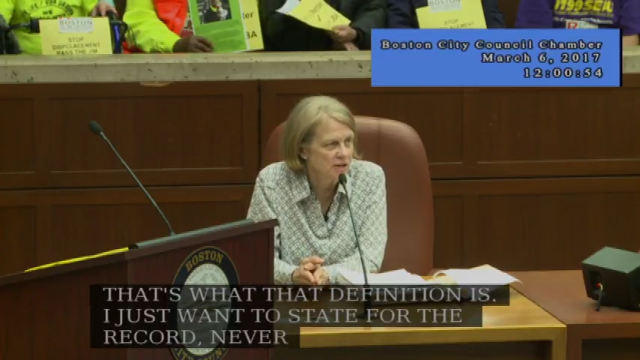 City of Boston employee Sheila Dillon inadvertently flashes the microexpression for “contempt” while discussing landlords raising the rent (1:53:31). Contempt is identifiable as an asymmetic tightening of one corner of the mouth. Schrier criticized unequal tax treatment for landlords compared to condo owners. He criticized the way the Act eliminates protections for elderly landlords with Medicaid trusts. He described the need for no-fault evictions when witnesses are afraid to testify. And he pointed out the lack of mandatory rent escrow. Sections 5A and 5C are a violation of MGL Chapter 40P. Combined with the Debt Collection Law, which invalidates Section 5B, all three major sections of the Jim Brooks Act are now known to be unlawful. Schrier admonished the city that “you can’t take private property for a public purpose.” The cheers were so loud the chair had to call the meeting back to order. Department of Neighborhood Development Chief Sheila Dillon went on record saying, “We didn’t want to go near rent control, it’s against the law.” She stated that the “reasonable rent” provision of the Act was designed to protect homeowners against banks during foreclosure. She made no acknowledgement of the Act’s poor drafting. She let the contradiction between her testimony and the Act’s text just hang in the air. 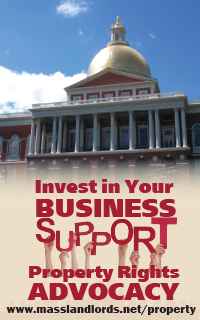 MassLandlords has no idea whether this hearing will have killed the Jim Brooks Stabilization Act with federal law. Lawyers are free to disagree, and often do, and probably will in this case. But Attorney Schrier came to the rescue one final time with his description of how other landlords are already defending against this act. First, landlords can use “stayover clauses” that increase the rent 1.5 times for any tenant that stays over a rental agreement. One MassLandlords member speaking off the record already uses these. Second, landlords can and should spell out 10% automatic rent increases and negotiate these down each year, as needed to keep good tenants. 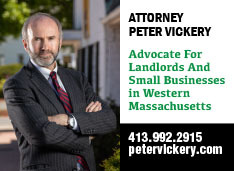 Either of these measures will provide substantial defense to landlords looking to avoid the rent control aspects of the Act, should it be passed into law. As always, consult with an attorney before taking specific action.